It’s just another facet of the Fantasyland expansion — the closing of something familiar to make way for something new. While it may be a little sad — it did open with the MK back in 1971! — it is also really exciting because this just means that there are new favorites about to be introduced! These “new favorites” will no doubt be just as cherished by future generations — as well as by all of us too! So, here is my quick farewell to one of the more “adult-friendly” — I mean it was called “scary” and definitely lived up to that name for quite a few audiences! 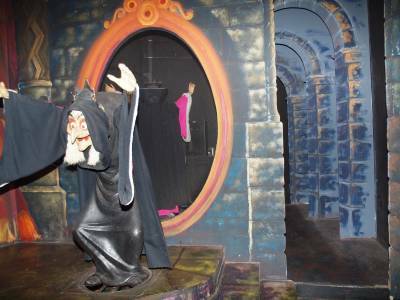 — “dark” attractions of the old Fantasyland. Thanks for the memories ;-); I can’t wait to see what lies ahead! Hi, I have been searching and studying for my families trip to Disney World (leaving Monday!). I am so stressed out trying to plan what to do first! We are taking our 4 year old granddaughter (her first time) and will have a half of a day in Hollywood, one day in Animal Kingdom and two days in Magic Kingdom. I would really love someone to just say go here first then get a fast-pass for there before you ride this….Did I mention that I’m stressed? Help!!! Of all the parks you listed I actually did a blog on each one (Magic Kingdom, Disney’s Hollywood Studios, and Animal Kingdom) several weeks back. However, admittedly, it was done from an adult-only standpoint, but I think they might help you get a better feel of what’s in each park. Also, make sure you visit the PassPorter message boards. Everyone there will be able to help you out with any questions, advice, etc. that you may need. 😉 See you over there! I wish that I could tell you that you have enough time to do what you HOPE to do, but there is soooo much to see and do, with waiting in lines, you may find yourself even more stressed out. We too, just came back from a BIG family trip with 10 of us going and we too tried to plan our day, we actually did pretty good, but that found that the heat of the day was really a lot on the kids and us, and we went out two days so the kids could go swimming in the pool at our hotel, etc. and then back in later toward evening. If you go in the summer, DO get water bottles, you can even put in some of those water flavoring packets that are energy or those that provide some electrolytes in the flavoring, that helps the kids stay hydrated and adults too. We pour some of the water out of the bottles, put the flavoring in, freeze them, then put a little water in to fill the bottle up. We take a collapsible cooler too so the water bottles stay cold, but our trick is too, that we buy those insulated bottle covers at a local dollar store here at home to take along. They work wonders to keep the bottles extra cold most of the day. Treats are expensive too in the parks, we pack each kid a zip loc bag and them fill what they want for a snack, each has different likes, so we buy various things for them . Good luck and have a great time ! That’s a good tip about the freezing of the drinks for the hotter months. DH and I went one year in May — and it was hot! — with family friends and my friend’s parents did that. Her mom then wrapped the bottles in washcloths from the hotel to wick up the sweat from the melting drinks, but by the time they wanted a drink, they were always cold (or cool) due to any ice left floating or from the cooler washcloths helping insulate some of the cold. They just kept them in their backpack that they took to the parks with them anyway. I still can’t believe that when I go in October that ride will be no more. It was a ride that I always had to ride. I will truly miss it. I know that they (Disney) are doing wonderful things in Fantasyland but still did they really have to close Snow White????? Especially now when there are so many movies coming out about Snow White. 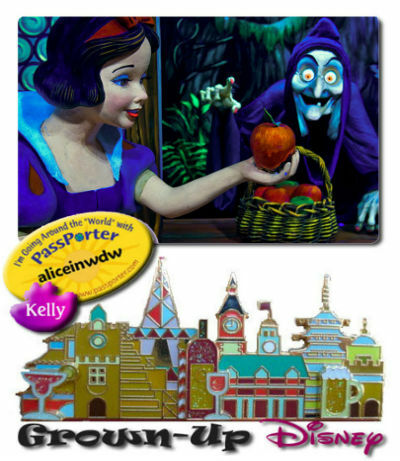 Just want to thank you for the wonderful little walk into Snow White’s Scary Adventure. I wonder what’s going to happen with this ride at DLR? For now the WDW version of the ride has been closed due to the Fantasyland expansion project. Not knowing too much about DLR myself — although it’s on my To-Visit List! 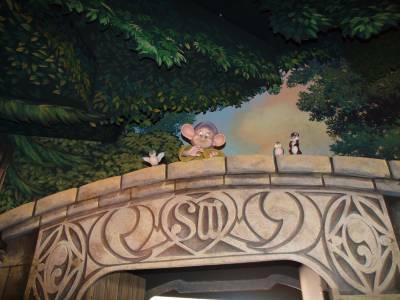 — I think the Snow White ride there is not scheduled for any closure, other than any future refurbishments that all rides occasionally go through for maintenance, enhancements, etc.